In life, you’re not going to get along with everyone—that’s just a fact. But you can exhibit tolerance for people who you deem “difficult” but whom you cannot help but be around, such as someone in the workplace. In Dealing with Difficult People 3470, an online continuing education course through UWA Online, participants will learn how to use their communication skills to deal with the types of personalities that rub them the wrong way. Dealing with Difficult People 3470 is an independent-study course that will help participants identify difficult people in their lives and decipher why it is that they may act that way. The course will also introduce strategies for dealing with the behaviors of people you do not particularly mesh well with—or perhaps that you do not understand. As an independent-study course, Dealing with Difficult People 3470 will provide students the resources they need to successfully complete the course via online material. A student helpdesk will be available for technical support during course enrollment. Improve your patience and acceptance today with this course through UWA Online Continuing Education e-Learning! 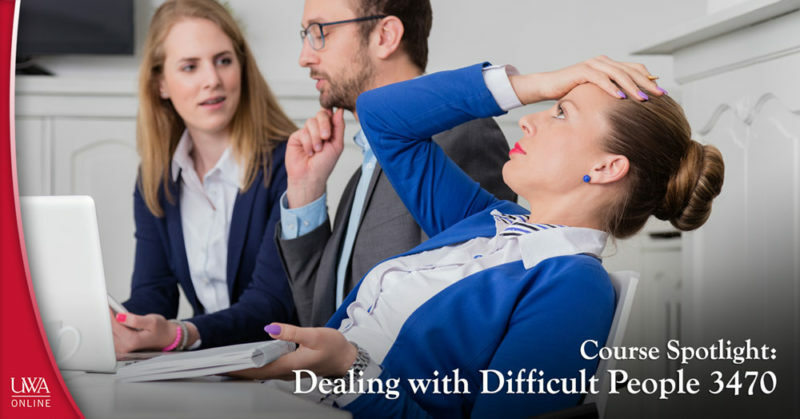 To register for Dealing with Difficult People 3470, click here. To browse our selection of other non-credit, online courses, visit www.uwa.edu/ce. If you’re looking for a responsibility-driven career that requires strong communication skills, the ability to work with your hands and combinations of other interpersonal and technical abilities, then dental assisting could be your ideal career position. As the person in the dental office who typically spends the most time with the patient from the start of their visit to the end, dental assistants are responsible for comprehensive and varied tasks throughout the office. 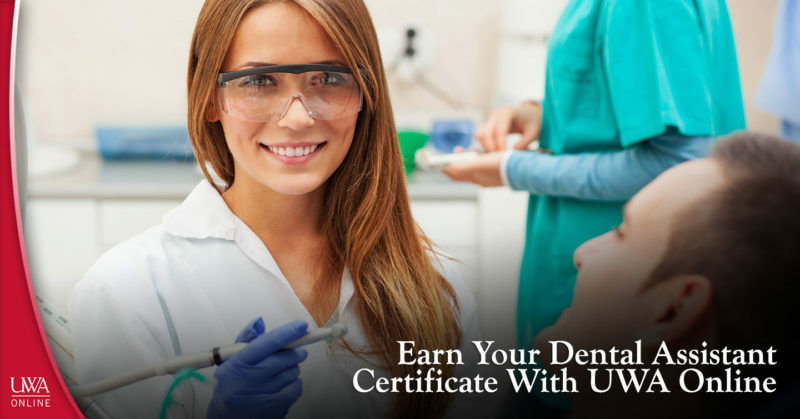 You can prepare to earn your dental assistant certificate through UWA Online Continuing Education! UWA Online’s Dental Assisting Program prepares students for entry-level positions in dental assisting—one of the fastest-growing healthcare professions that currently is short staffed. In fact, a career in dental assisting ranks as the fourth fastest-growing occupation in the healthcare technician field, with studies projecting that more than 400,000 assistants will be employed by 2018. Upon successful completion of this dental assistantship program’s courses, students will be prepared to take included certification exams: The Dental Assisting National Board’s (DANB) Radiation Health and Safety (RHS) exam and the DANB’s Infection Control Exam (ICE). The RHS and ICE, along with the DANB’s Anatomy, Morphology and Physiology (AMP) exam are required to earn a National Entry Level Dental Assistant (NELDA) certification. The RHS and ICE are required along with the General Chairside (GC) exam to earn a Certified Dental Assistant declaration. The RHS and the Orthodontic Assisting (OA) exam are required to become a Certified Orthodontic Assistant (COA). By taking the RHS and ICE component exams, you will be well on your way to completing any one of these three dental assistant certifications. Participants of this program will have access to educational mentor Patrice Arevalo, who has a degree in medical assisting from The Career College of Northern Nevada and a degree in dental assisting from the Community College Air Force. Arevalo exists as a resource to participants by answering questions, monitoring program progression and reviewing quiz and test results. Launch your new career and earn your dental assistant certificate with UWA Online starting today! Registration for this program is open until Dec. 15, 2017. Interested in registering? Click here! Our non-credit continuing education courses are available to anyone for the purposes of professional development, career training, hobby fulfillment and more. Browse our courses at www.uwa.edu/ce! In Alabama, August means back-to-school! Though the University of West Alabama’s campus has been quiet over the summer, this month students will come back to Livingston in full force—eager to start another school year and experience everything that comes along with being a UWA Tiger. That being said, there are a selection of UWA campus events happening in August 2017. 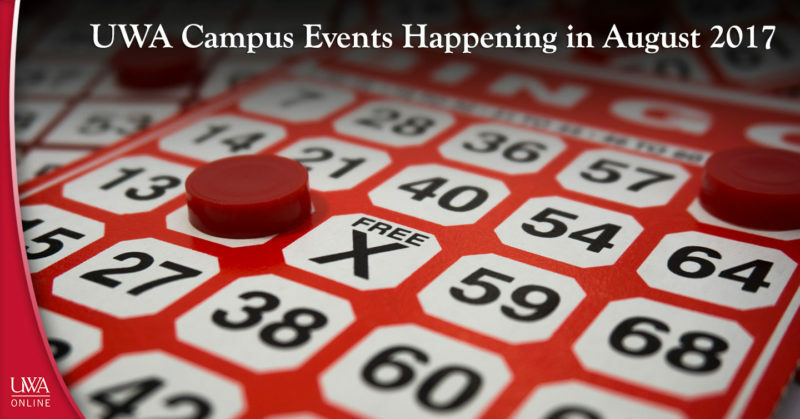 Whether you are an incoming freshman or seasoned graduate student or local sports fan, UWA has a little something for everyone to add to their calendars! About: This mandatory orientation for F-1 students will include a welcome from the International Programs staff, an orientation presentation, banking presentation, Tiger ID card pickup, ESL testing (if applicable) and more. When: Check in from 8:30 to 9:30 a.m.
About: Watch the UWA Tigers Men’s Soccer team take on Jones County Junior College of Ellisville, Miss., in this exhibition game. About: Win Tiger Bucks by playing bingo! Tiger Bucks can be used at a variety of on and off campus restaurants and stores, as well as vending machines and on-campus laundry. Click here for a full list of places where you can use Tiger Bucks. When: 8 to 9 p.m.
About: The UWA Campus Activities Board presents comedian Chico Bean from MTV’s Wild ‘N Out as part of UWA Welcome Back Week! A native of Washington, D.C., Chico has opened for Chris Wiles and is a founding member of the NC Comics All-Stars as well as NC’s Freestyle Funny Comedy Show. When: 8 to 9:30 p.m.
About: The UWA Campus Activities Board presents magician Mike Super: Magic & Illusion as part of UWA Welcome Back Week! A finalist of America’s Got Talent and a winner of NBC’s Phenomenon, Mike Super has a passion for mystifying his audience members, some of whom have included the Hollywood elite like Ellen DeGeneres, Jay Leno, Kenny Chesney, Kim Kardashian and more. About: This twice-a-year UWA tradition seeks to help students connect with their specific areas of interest around campus. 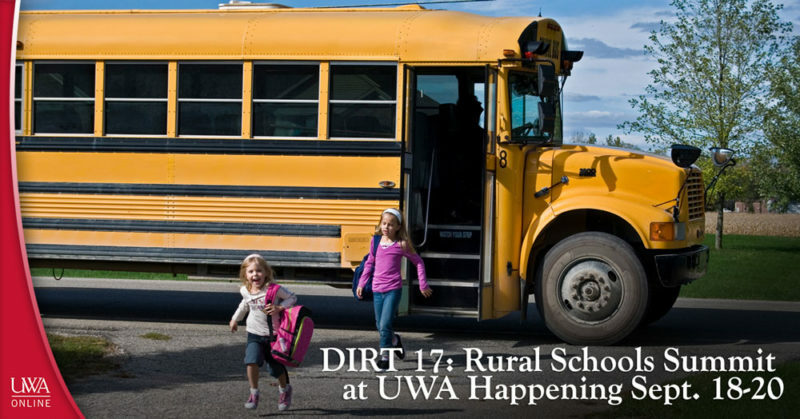 Students will be exposed to hundreds of organizations, community vendors and UWA campus departments. About: Watch the UWA Tigers Men’s Soccer team take on William Carey of Hattiesburg, Miss., in this exhibition game. About: The Miss University of West Alabama Pageant is held each year in the spring and is affiliated with the Miss Alabama Pageant, Inc., as an official Miss America preliminary. This meeting is for persons interested in entering the Miss UWA 2018 Pageant. About: Have a knack for wiffle ball? Get your skills ready for the University of West Alabama Intramural Wiffle Ball League Tournament. About: The long-anticipated next annual release of the Madden NFL franchise comes out Aug. 25, 2017. Hit the ground running by participating in UWA’s Madden 2018 tournament this month! About: Learn about all of the group exercise classes that will be offered on campus this fall including Aqua Fit, Boot Camp, Workout Warriors, Spin and more. When: 5:15 to 7:30 p.m. The variety of UWA campus events happening in August 2017 are evidence of the vibrancy that fall semester brings to Livingston! Not local to Livingston but want to get involved with UWA? Register for one of our online continuing education courses today! Do it as a hobby, or add a course or certification completion to your resume. Visit www.uwa.edu/ce to browse our course offerings! The prevalence of social media leads employers to look for individuals skilled in popular forms of blogging tools. Blogging to advertise and provide information to the public can make a business appear attractive and knowledgeable as well as spread information about a cause or establish a business’ leadership in the industry. Students of WordPress.com Essentials 3666 will learn to utilize one of the leading blogging platforms in social media. blog and social media integration. 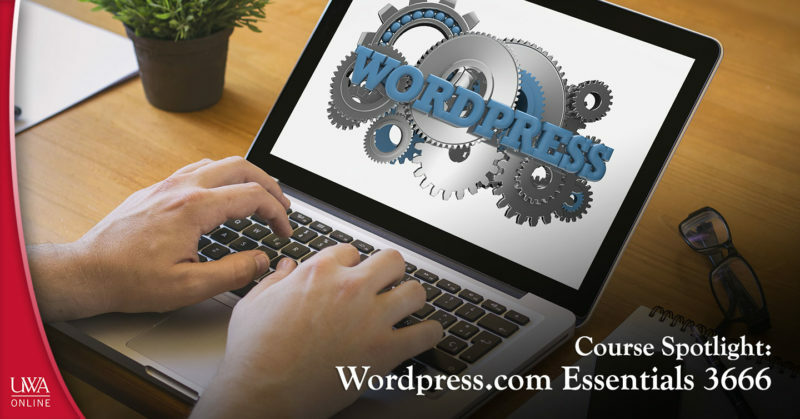 The successful completion of WordPress.com Essentials 3666 involves students creating a completed and optimized WordPress blog through an understanding of the various settings and features offered by the platform. The instructor of WordPress.com Essentials 3666 is Deltina Hay, author of The Social Media Survival Guide, a textbook taught in schools worldwide. Hay is well-written in topics of social media, search optimization, and the mobile web. Her graduate program studies include computer science, applied mathematics, numerical analysis, nonlinear dynamics, and psychology. She has worked in programming and Web development for over 30 years, and currently sits as the Board Chair of the Independent Book Publishers Association. The course does not require the additional purchase of materials, and will be a 24/7 online class. Tuition is $159, and registration for the course closes Friday, December 15, 2017. Become a whiz at WordPress blogging today with WordPress.com Essentials 3666, an online continuing education course through UWA Online! To register for WordPress.com Essentials 3666, visit the course listing website. Stay tuned to the UWA Continuing Education blog for more course spotlights, community news and continuing education advice! To browse more of our course offerings, visit www.uwa.edu/ce! When it comes to securing a high-level position in the workforce, it helps to have the proper credentials to illustrate that you are qualified for the gig. That’s where the University of West Alabama Online’s professional development certificates come in. Each of our online certificate programs allows you to take work-at-your-own-pace, non-credit courses that are designed to equip you with the knowledge and skills you need to become a better employee, manager, administrator or whatever title you currently hold or are vying for. Here, we’ve outlined six professional development certificates that you can take this fall with UWA Online Continuing Education e-Learning to bolster your resume and heighten your qualifications. The 10 Project Management Knowledge Areas and their relationship to the Five Project Management Processes. 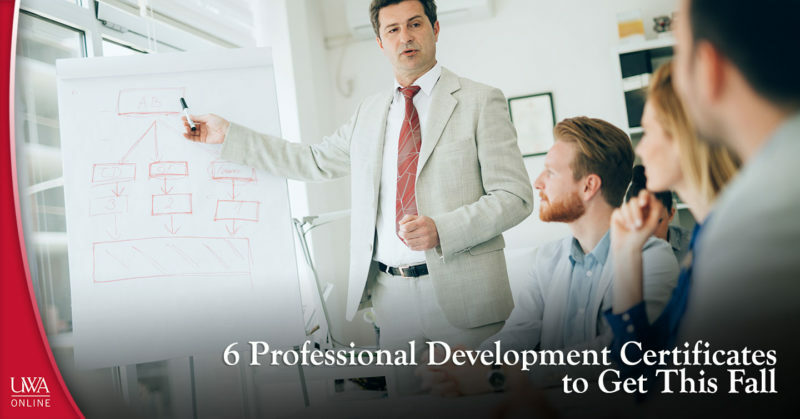 By adding one (or more) of these professional development certificates to your resume, you will not only be better able to back up your qualifications, but you will be able to improve what you have to offer in the workplace in the eyes of your employees, coworkers and/or superiors. To browse our other certificate and course offerings, visit us at www.uwa.edu/ce! Want a peaceful, aromatic atmosphere in which to relax, read, or study? 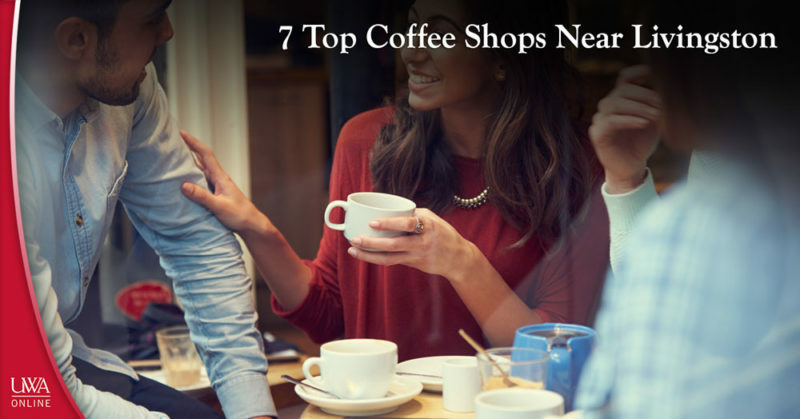 Want to make a quick coffee and snack stop before hitting the road? Sometimes, a good day is topped off by a visit to the local coffee shop with a sweet pastry and delicious caffeinated beverage. Among the choices of coffee shops near Livingston, there are several charming cafes that make their home near our little spot in West Alabama worth the visit. Located in downtown Livingston, this café serves a variety of coffee and tea beverages, sandwiches, and paninis for breakfast, lunch, and dinner. Additionally, ice cream treats including milkshakes, sundaes, and ice cream sandwiches help customers cool off in the summer! The homely atmosphere makes this shop a great place to take or escape from your studies. Check them out on Facebook. Across the state line in Meridian is the Scarlet Cup, offering quality coffee and tea drinks, as well as smoothies, frozen lattes, and more! With a roomy interior and beautiful drinks, the Scarlet Cup is an excellent step above Starbucks. Check them out on Facebook or visit their website. Mon–Sat: 6:15 A.M.–6 P.M.; Sun: 7:15 A.M.–7:30 P.M.
Get away from the daily grind with The Daily Grind café and restaurant in Meridian! This shop in north Meridian makes delicious soups, salads, and sandwiches on top of flavorful coffee drinks. They cater, too, and offer cooked-to-order beignets. Of the coffee shops near Livingston, The Daily Grind is a beautifully decorated space in which you can relax, study, hold a small business meeting or visit for a quick caffeinated beverage. Check them out on Facebook or visit their website. Looking for a lovely little coffee shop that sales not just delicious coffee and original sandwiches and salads but also gorgeous pastries, cakes, and bread? Lulu’s Coffee Shop in Demopolis is exactly that, promising picturesque drinks and baked goods for a modest price! Check them out on Facebook. If you’re looking for coffee shops near Livingston with a sweet, rustic vibe and a welcoming Christian atmosphere, Southern Grounds Coffee Shoppe in Thomasville is one café to visit! This coffee shop offers specialty coffees, housemade cakes and cupcakes, and even a choice of ice cream. Visit them on Facebook or visit their website. Less than an hour’s drive from Livingston, Tuscaloosa boasts its own plethora of cozy coffee shops, including one of any Heritage House Coffee and Tea locations. Here, you’ll find a relaxing atmosphere, gorgeous baked goods, and gourmet drinks. With three locations, Heritage House is always within reach for Tuscaloosa residents. Check them out of Facebook. Visit Heritage House’s website for directions and hours for any of their stores. The Monarch Espresso Bar serves craft coffee, including selections from Honduras, Peru, and Ethiopia, and a variety of specialty drinks to fill up any sort of café craving. This quaint vibe will provide those in search of coffee shops near Livingston a generous stay in Tuscaloosa! Check out their Facebook or visit their website. Rest assured that you have options for a caffeine or pastry craving near Livingston! For more information on the Livingston community, continue following the UWA Continuing Education blog! If you are interested in learning about our non-credit, online continuing education courses, check out our course offerings at www.uwa.edu/ce. Whether you are a recent college graduate looking to land your first gig, or you are a seasoned career person looking to make a change, this UWA Online Continuing Education course serves to help you get to where you want to be in terms of job fulfillment. 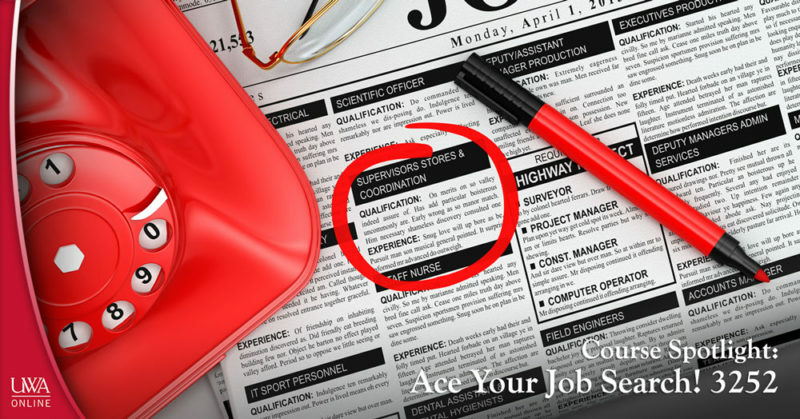 In Ace Your Job Search! 3252, participants will focus on career planning, resume writing and interviewing skills—all in an effort to help them become champions when it comes to securing their ideal places of employment. The tuition for this course is $195 and does not require the purchase of any supplemental materials. Participants will have access to a “mentor expert” help desk feature, through which they will be able to submit questions directly to an expert. Start making the most of your future career opportunities today by registering for Ace Your Job Search! 3252 through UWA Online Continuing Education e-Learning! To register, click here. To browse all of our course offerings, visit us at www.uwa.edu/ce! Back-to-school time for campus-goers is coming up quickly, which means students, parents and teachers will be budgeting for their back-to-school supplies this month and next. For UWA Online’s continuing education e-Learning courses, things are a little bit different in terms of what you need to be well-equipped for class, but certain supplies are still necessary. The back-to-school supplies you need for online courses differ in that all of your work will be done remotely from your computer—meaning having well-working technology is your number one priority. 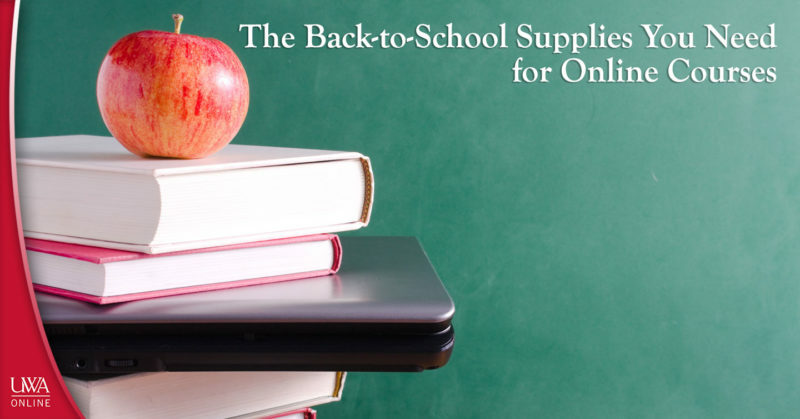 Specific courses may require specific supplies, but in general, the back-to-school supplies you need for online courses include the following. Current desktop or laptop computer. If your computer is a few years old and in good working condition, then you do not necessarily need to go out and buy a new one for our education e-Learning courses. However, newer computers are sure to have sufficient memory and computer processing speeds that will be necessary to access, work on and submit materials for our online continuing education courses. Up-to-date operating system. Many of our e-Learning courses require Windows XP, Vista or 7 and Mac OS X 10 or higher with Windows. An outdated operating system can mean that certain programs will be incompatible to run on your computer. Broadband or high-speed internet access. This is a requirement for our UWA Online Continuing Education e-Learning courses. Broadband includes DSL, cable and wireless connections. Dial-up is insufficient due to the fact that loading will be too slow, and viewing large audio and video files may be impossible. Headphones with microphone. Headphones can be useful in the event that you need to watch a video or listen to a discussion and you do not want to disturb others that may be sharing your space. Some of our courses require or suggest having a microphone for instances of verbal class discussions, or to create recordings. Planner. Being successful in an online course that you work on remotely is all dependent on how you organize your time. It helps if you dedicate certain times of day to working on your online courses, and you do not deviate from that plan. Organizing your time in either an electronic planner or a paper one can help you stay on track. Pen and paper. Despite the extreme focus on top-notch technology, you should always have pen and paper around in the event that you need to jot down an idea or take a note on the fly. As you listen to discussions, you may prefer to take notes using the tried and true pen-and-paper method, rather than trying to type. These types of school supplies never go out of style! The back-to-school supplies you need for online courses may go beyond these basics, but this list will help get you started. Another difference between those preparing to physically go back to school, and those planning to register for a remote online course is that with the latter, you get to decide when the best time is for you to start. Register for our online continuing education e-Learning courses at your own convenience, and complete them according to your schedule. To browse our course offerings, visit www.uwa.edu/ce! You wouldn’t recognize the University of West Alabama at its inception. Our university has humble roots deep in antebellum Alabama, and a quick look at UWA history tracks that growth from unassuming origins to the full-fledged university that UWA is today. 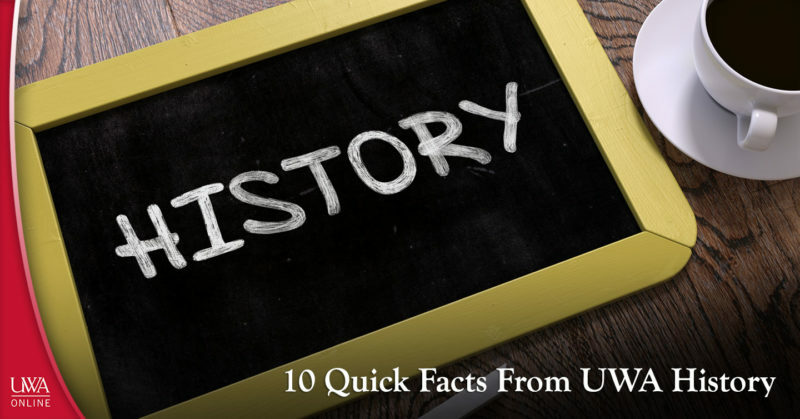 Get to know UWA with these quick facts from UWA history. Livingston Female Academy, which began in 1835, starts the University of West Alabama’s origins. The beginning of UWA history is a small, church-supported academy operating during a time of migration in Sumter County, where settlers where escaping the harsh oversight of law. At the time, academies were integral to the South, providing older children with preparatory work to continue their education into college. Tuition at the Livingston Female Academy was exceptionally less than one might expect and educational institution to charge. An interesting tidbit about UWA history is that tuition was $20 per term, plus an extra $5 for piano lessons and plus $10 to attend classes on French and embroidery. The most famous UWA president is Julia Tutwiler. Thanks to her, the academy received the first state appropriation given to female education. Additionally, it was through Tutwiler’s encouragement that the University of Alabama now includes female students. During Tutwiler’s presidency, the academy became the Alabama Normal College, the first of many major name-changes of UWA history. 1915 marks the year the school became co-educational. Accompanied by this change was the new president to replace Julia Tutwiler: Dr. George William Brock, who expanded the school and added Brock, Bibb Graves, and Foust Hall to the campus. Brock Hall was the site of the first major school building constructed by the academy. The hall was constructed shortly after Alabama legislature granted a tax-exempt status to the institution. The academy became accredited by the Southern Association of Colleges and Schools (SACS) in 1936. At this time, the United States was suffering from the Great Depression. Livingston State Teachers College, formerly the Alabama Normal College, maintained a focus on educating future teachers, and during the presidency of Dr. Noble Franklin Greenhill, saw the introduction of Greek life to campus grounds. The school nearly closed due to low enrollment by 1944. And unfortunate part of UWA history is around World War II, when men were leaving to fight in the war, dramatically dropping enrollment and attendance. A master’s degree program was added in 1957. 1959 marked the first year in UWA history that the first master’s degrees were awarded to students at the institution. The Ira D. Pruitt School of Nursing was established in 1973. The Allied Health Linkage had also been established with the University of Alabama in Birmingham, and a dual degree program was developed alongside Auburn University. UWA underwent multiple more name changes before settling on the University of West Alabama. By the time it was the University of West Alabama, the school’s name had changed from the Livingston State Teachers College to Livingston State University to simply Livingston University. Finally, in 1995, Livingston University became the University of West Alabama to prove the commitment founded by UWA to its regional roots. UWA history is long and varied; the institution we know today focused on different goals, called itself many different names—as if it was growing into its shoes and the responsibility it set upon itself. For more insight into UWA, Livingston and the surrounding area, continue following the UWA Continuing Education blog! If you are interested in learning about our non-credit, online continuing education courses, check out our course offerings at www.uwa.edu/ce.